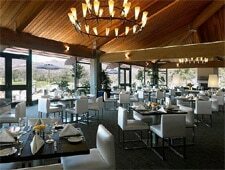 The casual Clubhouse offers up a contemporary décor and menu. : Carmel Valley Ranch’s remodel includes a ground-up multi-million-dollar restoration of its Pete Dye golf course, a hotel turned hotel-condominiums, and the revamp of its restaurants. The bar shakes current cocktails; Scotch yields to pineapple mojitos and pomegranate martinis worthy of flashier urban centers. Fare is standard, but reliable, including burgers, wraps, pressed sandwiches and salads, with some bright spots like truffle fries and a jack-and-tomato pressed sandwich with tomato soup. The interior is light and open, and takes advantage of pleasant views of the greens and surrounding hills.